To get the most enjoyment from a boat, it’s important to select a boat design that’s well-suited for how you’ll use your boat. Here’s a look at different boat designs and what they’re used for. Deck boats, as might be surmised from their name, have lots of room on their decks. They have many seats and plenty of storage (often beneath the seats), which makes them ideal for hosting on-water parties. With a deck boat, you’ll have enough room for lots of friends and you’ll be able to store several coolers or snacks onboard. Additionally, these boats are intentionally designed so people can easily move around and mingle. Deck boats strike a nice balance between pontoon boats and bow riders. Unlike pontoon boats, which are supported by two or three pontoons, deck boats have a classic V-shaped hull that lets them better handle waves. Bow riders also have V-shaped hulls, but they aren’t designed to hold as many people or let people mingle as easily. Bow riders are so-named because they have an open bow where people can sit. These seats are exhilarating to ride in, as passengers are both close to the water, and feel the bow’s up-and-down movements as the boat goes over waves. 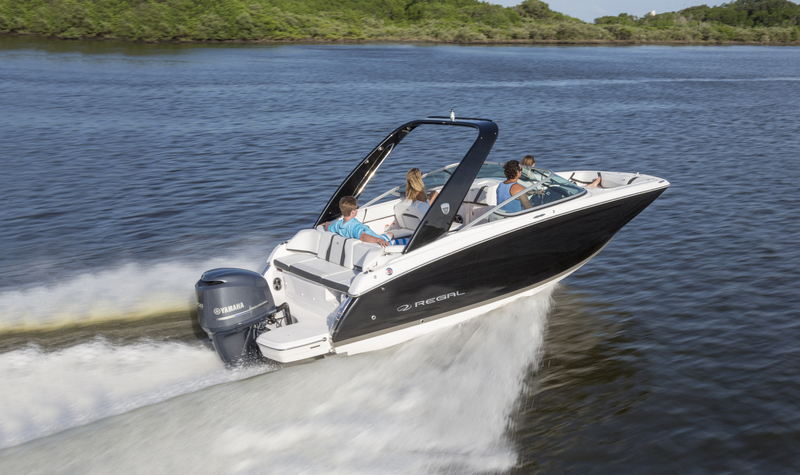 Designed to provide a thrilling ride up front, bow riders truly turn boating into a sport. Many people who own bow riders also use them for water sports, such as tubing, waterskiing and wakeboarding. Most bow riders are already equipped with powerful engines, which are needed to make riding in the bow exciting. Thus, it’s not necessary to invest in a new engine when taking up a water sport. Also, everyone in the boat can watch whoever is being towed. Bow riders fall in-between deck boats and cuddies. Bow riders usually have deeper V-shaped hulls and slightly higher hulls than deck boats, which let bow riders handle waves more easily than their party-boat counterparts. Bow riders usually aren’t as large as cuddies, though, so they can accelerate faster, which is important when lifting a water skier out of the water. Cuddies are versatile boats that are perfect for families who want to do lots of things on the water. A good all-around boat, a cuddy is the practical choice if you’ll be using your boat many different ways in the coming years as your family grows up. Yachts are sometimes thought of as massive boats that only the very rich own. In the boating industry, though, boats larger than cuddies are often called yachts. Yachts have a covered bow that’s large enough to sleep in, and most also come with some kitchen where food can be prepared. They’re also large enough to handle major waves should a storm come up. All of this makes them well-suited for taking on overnight trips. For help finding a new boat that you’ll love owning, contact us at Petzold’s Marine Center.